How to paint Galadriel, Celeborn, and Galadriels Mirror! 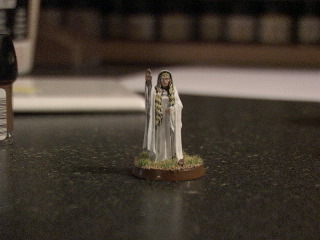 Today we have Three Models to paint, Galadriel, Celeborn and Galadriel's Mirror. These are all very nice models from GW's Fellowship of the Ring line. 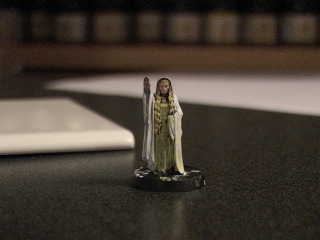 Let us begin with Galadriel! 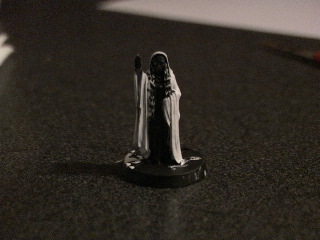 The First thing you'll want to do is prime Galadriel Black, you can use white if you choose but for most of my purposes I've chosen black. 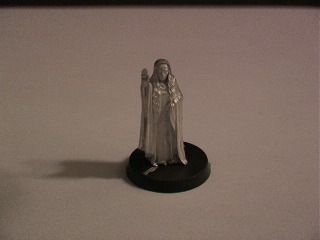 Then go ahead and let that dry, then paint her cloak until it is a very clean bright white. Now you want to take some Sunburst yellow, and lightly paint Galadriel's hair, and then mix in a little bit of Elf Flesh and do another coat with that until you have a nice blond look. Now paint a light coat on her face making sure to leave the shadows under her eyes. 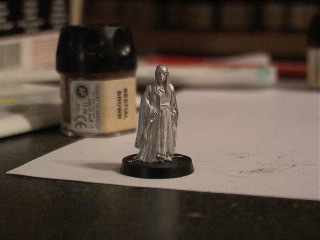 Now you'll want to go ahead and paint the rest of her dress white, and get a good coat of Elf Flesh on her hands followed by a dot of white on Nenya. Lorien being a beautiful place with lots of trees and grass, we're going to make sure we have a nice clean look to Galadriel's Terrain. Ad small and large globs of Goblin Green to your sand covered base and that should give it the look of the shore line where she would be making that pose. 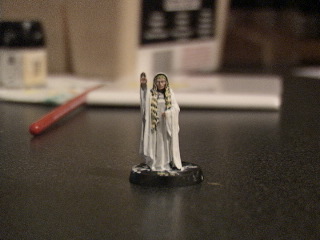 Now your Galadriel is ready to go! 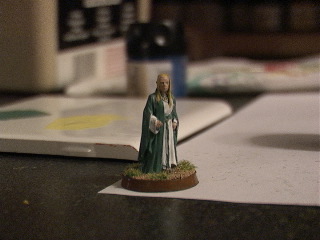 Celeborn is just about as easy as Galadriel, a simple robe with a easy to paint face and hair. Go ahead and prime your Celeborn model, and let him dry. Now go ahead and mix Spacemarine Blue, with Goblin Green until you get a color that you like for Celeborn's Robes. 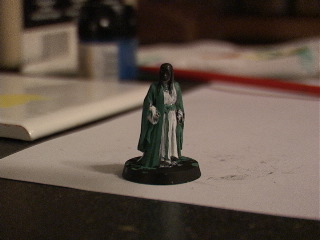 Cover the robes, and paint in the white on the inner area and on the sleves, then follow up with your blue/green color on his sash. Now toss on some Elf Flesh for his face, again making sure to leae a good shadow around his eyes, and paint his hair with the same colors used for Galadriel's hair, and paint Celeborn's hands. Now toss on the same Lorien Terrain, and you're set! 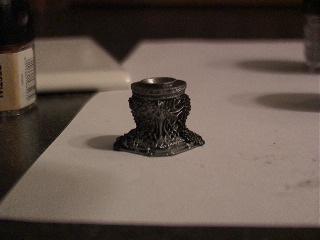 Now one of the most detailed pieces in the Games Workshop set, Galadriel's Mirror. After priming the mirror, dry brush the entire model with Boltgun Metal, then follow up with a lighter coat of Chainmail. 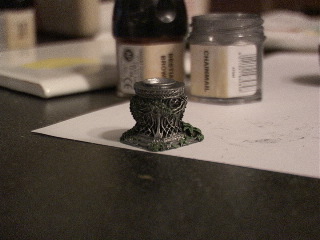 Painted a miniature already? Have pictures? Send them in! We'll feature them in our Games' Workshop customs gallery! Just drop em to Havens@TheOneRing.net and we'll put the best models up for all to enjoy.